Captive-bred (F1) adult male specimen displaying neutral behaviour patterning. Young F1 specimen in the aquarium. Currently known only from the type locality in the Ka Dat Chaung river system, Mon State, south-eastern Myanmar. This is part of the larger Sittaung River drainage. In the description the type locality is described as a slow-flowing small river around 50 metres in width with very shallow (20-30 cm deep) water. The substrate was composed of boulders, small stones and sand and no aquatic plants are mentioned although there were patches of biofilm in some areas. The only sympatric species was the loach Acanthocobitis zonalternans. The collection was made during the dry season; Mon has a tropical climate and there is a pronounced rainy season between June and November. During this period rivers swell with a marked increase in flow rate and turbidity. Unknown. The largest specimen in the type series measured 34.6 mm but the first aquarium specimens have already exceeded 50 mm. B. juergenschmidti will thrive in a well-structured set-up with a sand or gravel substrate plus plenty of water-worn rocks and pebbles to provide cover. Plant species that can be grown attached to the decor such as Microsorum, Taxiphyllum or Anubias species can be added if you wish but aren’t essential. Temperature: A figure of 80.4?°F/26.9?°C was recorded at the type locality in the month of March. Mon has relatively stable air temperatures with an annual average of 79.9?°F/26.6?°. pH: 6.0 – 7.0 with 6.4 recorded at the type locality. Hardness: Should prefer soft water within the range 18 – 90 ppm. If you do intend to house it in a community tankmates must be chosen with care. It is slow-moving with a retiring nature and may be intimidated or outcompeted for food by larger/more boisterous tankmates. Peaceful cyprinids such as Trigonostigma or smaller Rasbora species are likely to make good choices as are gouramis and other surface-dwelling species. Accommodating it in a biotope-style community of ? fishes from Myanmar ? is trickier but a couple of suitable species known from the Sittaung basin are Danio nigrofasciatus and Acanthocobitis zonalternans. B. juergenschmidti has been bred in captivity on at least once occasion since it was first collected in March 2010. Members of this genus are cave spawners that form temporary pair bonds and are not usually too difficult to breed provided the tank is arranged correctly (see ‘tank set-up’). Other species are best omitted if you want to raise good numbers of fry although in a mature, well-furnished community a few may survive to adulthood. Either a single pair or a group of adults can be used but if using multiple males be sure to provide each with a cave to defend. Water parameters should be within the values suggested above. Feed the fish with plenty of live and frozen foods and spawning should not present too many problems. This species is essentially unknown in the hobby at time of writing. 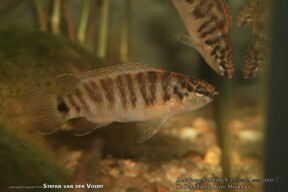 It was discovered by German aquarist Horst Linke in early 2010 and before official description was known as B. sp. East Myanmar (Ost Myanmar in Germany). It can be differentiated from other members of the genus by a combination of characters as follows: absence of a blotch on the posterodorsal corner of its opercle; no cleithral blotch; bar 1 (on caudal fin base) in adult males broad and solid rather than reduced to a single blotch on centre of caudal peduncle or split into three separate blotches; bar 2 without a blotch on dorsolateral aspect of caudal peduncle; caudal fin of adult males with a white margin posterodorsally and posteroventrally. A more detailed synopsis can be found in Comparative notes of the original description. Badis dibruensis, a new species (Teleostei: Badidaae) from northeastern India. 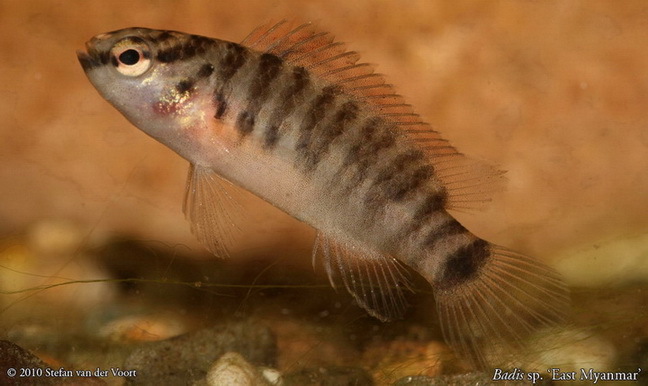 From “Species Profiles,” I clicked the Cichlidae link under Perciformes, and was startled to see Badis juergenschmidti listed on page 2 of the cichlids. Maybe a wrong tag somewhere?